Last week’s 100-pounds victory marked the end of the first phase of my Operation Melt journey and I killed that first goal. Now, I am moving into phase 2 which will last for the next 3 months… I shared my phase 2 goals last week. This was a week of mixed results at best. I tried to keep going, but my body decided to resist a bit. So, I have added in something new into my journey. I am hoping to see some new results from this. After achieving the 100 pounds lost mark, my weight went up a little bit and stayed there. I am not sure if it was lifestyle related and I was just eating and drinking the wrong things or if it was because of muscle growth. Based on my calories in and calories out, I knew I couldn’t have added fat, so I was dumbfounded. Even days when I didn’t have any alcohol, I still wasn’t losing weight. It was pretty frustrating to hit my goal, then not be able to get back there despite lots of work to make it happen. Then, suddenly, on a Saturday morning when my weight is usually higher from Friday night fun, my weight plummeted. I was at 100.8 pounds lost after being up for a week. I didn’t expect this, but there it was. So, back on track again! I think my body is just trying to keep it interested and trying to make sure that I know it is in charge. This week marked another interesting milestone in my journey, I started working with a trainer. Over the past several months at the gym, I have been observing each of the trainers from a distance. They each seem to have their own processes and work differently with their clients. Some of them have even been working out in the gym while I am there, so I have had the chance to see them doing their own workouts. Through all of my observing, one trainer has stood out to me because her workouts tend to be pretty fierce. She does some amazing things and is in amazing shape. I have watched her interact with her clients and she seems to be pretty patient with good rapport. So, I decided to talk to her on Monday. Turns out that she has ran marathons, has been a competitive bodybuilder and has a bachelors and masters degree in this stuff. So, I was sold! On Wednesday morning, we had our first session. It was just a 30-miunte session, but we crammed a lot of different exercises into that short time. We targeted areas of my body that I hadn’t been working on. This was an interesting experience. First, I had to decrease the weight I had been lifting…. A lot! I have gotten to the point where I can do bicep curls with a 70 pound barbell. Well, that did not translate at all to the exercises that my trainer was having me do. At one point, 10 pounds dumbbells were almost too heavy for me. Then, she had me doing walking lunges followed by blast-offs and that was tough. When I left the gym, I struggled a bit walking down the stairs. Then, Thursday morning, I could barely walk because my thighs hurt so much. I didn’t expect to be in as much pain as I was. So, I made a follow-up appointment for this coming Wednesday, let’s see if I do better. On Saturday morning, I told my trainer that she certainly helped me stay humble! On Sunday morning, I finished the first draft of my book about my journey. I am a long way from being able to publish the book, but my first draft is done. Now, I have to start the lengthy process of revising the book and removing redundancy, errors and nonsense. But, I have it all on paper now, which is a HUGE first step. Be on the lookout for the book because I am hoping that everybody who has been following my journey in real time will read the book. Weight change: 0.1 pounds GAINED! Week 39: Goal Achieved! Now What? This was a very big week for my fitness journey. I hit my goal, and not a day too soon because there were also some bad choices. Plus, I have spent some time thinking about what comes next. On Tuesday morning, I was still working through a big upward weight fluctuation from the prior week and the weekend. I expected to see a little bit of a weight correction after a couple of good healthy days including skipping drinking on Monday. On Monday, the scale said I was at the 97 pounds lost mark. So, on Tuesday morning, I was expecting to see a couple of pounds of retained water go away. I really expected to see myself at 98 or 99 pounds down. I went through my normal daily routine and then stepped on the scale. The result was a big surprise… I had lost 100.2 pounds. I had reached my goal of losing over 100 pounds and I did it 2 days before my 9-month anniversary! I was so very excited and very proud of myself. This may be the hardest I have ever worked for a goal that I set for myself. Plus, I didn’t just meet my “over 100 in under a year” goal, I crushed it! It was great to have this happen on Tuesday morning because the rest of the week was a bit of a challenge. I have talked previously about how my body has become increasingly sensitive to dietary decisions and how they drive weight fluctuations. My daily weight can vary as much as 4-5 pounds based on my body retaining water driven by what I have chosen to consume. High amounts of sodium drive these fluctuations as does drinking alcohol, especially beer. So, days where I eat more salty foods or drink more end up causing me to weigh more, temporarily, the next day. My wife and I are huge college basketball fans and we love March Madness. We have a tradition of taking the Thursday and Friday of the NCAA tournament off work and then we just hang out together for 4 straight days watching basketball. Sometimes we do this at home in our living room, but we prefer to be out where there are multiple TVs, other people and refreshments. This year was no exception. We started on Tuesday night with a wine tasting event, then our final night for our pub golf tournament and the first game. We have spent a fair amount of time over the past 4 days at bars and restaurants watching games, having some drinks (nothing crazy) and eating moderately unhealthy food. This means that my alcohol and sodium consumption is a bit higher than a normal week. So, you know what that means. My weight has been changing daily between the 100 pounds lost mark and the 97 pounds lost mark. Despite getting exercise and staying (mostly) within my calorie budget, I am seeing my weight up from retained water. This is not a big deal, it happens pretty much every week, but I am glad that the 100 pounds lost mark was reached early this week. If I hadn’t hit it then, it would be artificially delayed a week. 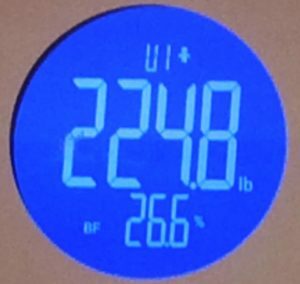 Though I am very experienced with the ups and downs of my weight through the week (that is why they say not to weigh yourself daily) I still get frustrated every time I see my weight increase. It bugs me! So… I am 9 months into this journey and I just hit my goal weight that I planned for the 1-year mark. This has caused me to start thinking about what comes next. I think I have a plan, but it is still taking shape a bit. Here is what I know now…. Most importantly, I am not stopping! I plan to continue to manage my calories in and calories out with the same degree of diligence that I have through the whole journey. It is getting harder to do because my daily calorie target is now under 1900 calories. I am doing a good job with creating some extra flexibility with daily workouts that average about 1000 calories each, but that will get harder once I go back to work in the next couple of months. But, I am committed and I am continuing what I started. I am going to try to maintain a 1.5 to 2 pounds per week weight loss until I hit the 1-year point. This is another 13 weeks and that will translate to about 25 more pounds. This is an important number because it will mean that I get myself under 200 pounds by 6/15 or so. Once I am under 200 pounds, I am going to switch to maintenance mode instead of losing. I will just need to figure out what that means other than I can consume about 1000 more calories each day. In addition to continuing to focus on losing, I am going to keep working on building. I have seen some impressive progress with my muscle definition and growth and I want to continue that. I have lots of areas of my body that need some work to shape the way I want them. I have a couple of performance goals that I want to achieve too. I want to get to the point where I am bench pressing and doing bicep curls with 100 pounds. I want to be able to do a pull-up. I want to be able to do 20 good pushups. So, each of those will still require some work. They may also require some support from a trainer that I keep talking about hiring. I also want to keep running. I don’t have a desire to do a half marathon or anything like that. But, I do want to participate in my first organized run, probably 5k, soon. I just need to convince myself that I am ready and I still struggle to get past 2 miles of continuous run without slowing down to walk for a bit. I am definitely going to run the 4-mile run at Oktoberfest in September, but I want to have a few 5k races before then. Finally, I am going to continue to share my story and help others. I am now about 75% down with the first draft of a book talking about my journey and how others can do it. I am also looking for some speaking opportunities including at the Columbus Project Management Development Day in the fall. I really want what I have learned to help other people achieve their fitness goals too. I have even researched how to become a certified personal trainer, but I am not sure I want to do that. 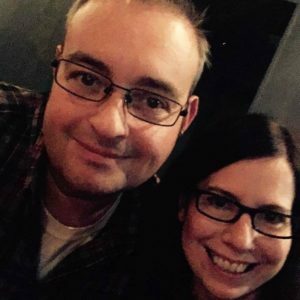 There you have it, my 9 month report on my journey … kind of a State of the Melt! Weight change: 0.2 pounds GAINED! I Did It! 100 Pounds Crushed! This means that I have lost 100.2 pounds since 6/15/2017 – that is less than 9 months! As most of you know, my goal was over 100 in under a year and I did it in far less time. As you will know if you read my blog on Sunday, I was frustrated with slow progress over the past week. I was so close to hitting 100 pounds by St. Patty’s day but was thinking that I would need an extra week. Nope! My body decided to engage badass mode instead! After seeing that I had passed the 100 pound mark, I thought about going and having an unhealthy breakfast (pancakes or something) to celebrate my accomplishment. But, I made a different decision. I went to the gym and did treadmill intervals at a new top speed and then did weight training with heavier weights than my previous max. So, I rewarded myself with a killer workout. Now my mind has started turning to what’s next. That will be a topic of thought through the rest of this week and something I will talk about in this weekend’s blog post. As a last thought, I want to take a minute to thank everybody who has been so supportive along the way. If it wasn’t for the positivity and support from Liz, my friends and many other people, I would very likely have given up and not seen this victory. I am so lucky to have such an amazing support system in my life! 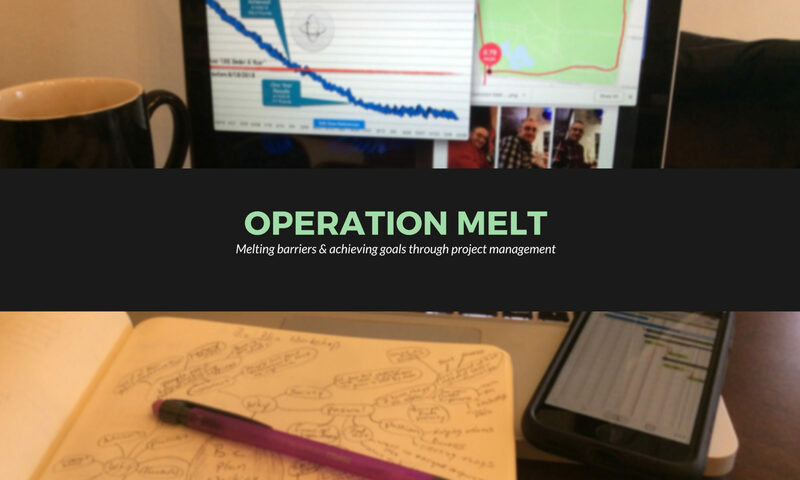 Another week of Operation Melt is behind me, but it was one where my progress was very slow despite lots of effort. It is getting much harder to keep up the same rate of weight loss and ongoing progress. It is particularly hard when my routine is so unpredictable given my current work status. Here are some highlights from this week. I have been able to spend lots of time at the gym and I continue to ramp up the intensity of the workouts. This week, I was at the gym 5 out of 7 days and each workout included a blend of treadmill running and weights. 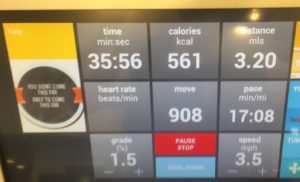 Plus, I have started making every treadmill session into at least a 5k as I want to get to the point that I am comfortable running a full 5k – right now, it is a blend of walking and running. In addition to the gym, I continue to layer on additional exercise where I can. One day this week, I added a spontaneous walk around the full perimeter of German Village in Columbus which was an extra 3.14 miles on top of my morning workout that day which was already 3.5 miles on the treadmill. Here is a picture from the treadmill when I hit my first 5k with a mix of walk/run. About 33-34 minutes total time. I am really pushing hard to work off the weight and pack on the muscles whenever I can. One of the other areas where I have layered on some additional exercise was by taking my first yoga class. I went to a free beginner’s yoga class at a local community center, Central Community House. It was called Saturday Stretch and was a good intro level class that focused on back, hip and leg stretches for this particular class. I was surprised at the places where I am and am not as flexible as I would like to be. Plus, I was surprised at how intense some of the stretches / poses could be with just body weight. It was good and I think I would like to do another one. One of the things I have been tracking through my journey is my heart fitness. I measure this through my fitness tracker which monitors something called my VO score which indicates the healthiness of my heart. It does this through some formula based on height, weight, age, resting heart rate and other stuff. I know, pretty informative, huh? 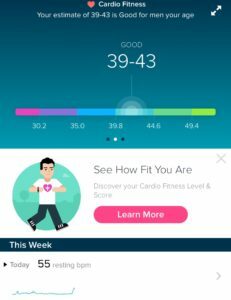 When I started my journey, my cardio fitness was in the “Poor to Fair” range and my resting heart rate was really high. As I have gone through this journey, I have watched the cardio fitness scores tick up into the “Fair”, “Average” and “Average to Good” range. This week, I hit a new milestone in my cardio fitness. I am fully into the “Good” range now. Between the cardio fitness, the continued personal records I am setting in exercise and the perpetually smaller clothes, I am continuing to see progress. Unfortunately, the most important area to me is not performing as good as I’d hope. On Tuesday of this week, I hit my new record weight loss at 98 pounds down. That was great and I was really excited. Unfortunately, I have learned that my weight losses follow a cadence based on my lifestyle. Mondays and Tuesdays are great days for weight loss and I tend to be at my lowest weight on Tuesdays. Then, in the back half of the week, my weight tends to have fluctuations up. I think this is related to early week being more home cooking and less restaurant meals plus, I make the beginning of the week non-alcohol days too. So, this week followed my traditional cadence of loss and gains. I ended up fluctuating up by 3 total pounds from my Tuesday low point. That is very frustrating! My updated goal is at risk! Over the past few weeks, I have said that I should reach the 100 pounds lost mark by St. Patty’s day, which is this coming weekend. I secretly wanted to reach it by 3/15 since that is the 9-month anniversary of starting my journey. This is all well ahead of my original goal of over 100 in under a year, which means June. Based on my cadence of weight loss and fluctuations, my current rate of loss and the fact that March Madness starts this week (alcohol and junk food), I think my revised goal is at risk by a few days or a week. Plus, the other factor influencing my weight loss is that my muscles are growing from weight training and packing on muscles. This is good, but it is still impacting me reaching my weight goal that has been the focus of this journey. While I will be a bit disappointed if I don’t hit the 100 pound mark by St. Patty’s day, it is not going to shake my focus. I am going to be successful on this journey and have been very successful so far. This is still a top priority for me and I am still as committed as ever. One thing that is helping me stay focused right now, during a time that would be very easy to quit, is my newest project. I mentioned before that I think I am going to write a book about this journey. Well, I have made progress and I am about one-third done with the first draft of the book. I am pretty excited about that!